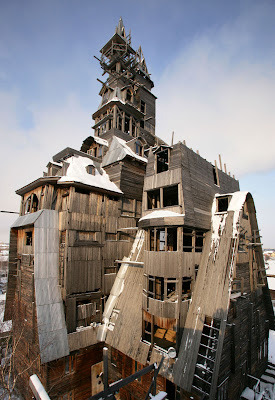 It no longer exists, but at one time, the Sutyagin House in Archangel, Russia, was was the largest wooden structure in the world. Its impressive 13 floors (reaching a final height of 144 feet) was all the more impressive when it is revealed that it was pretty much designed and built by one man, Nikolai Sutyagin. Nikolai was a hard working man who had grown up in the Soviet Union. 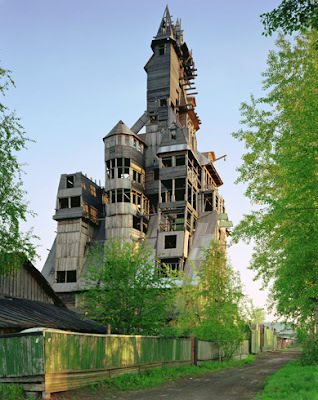 In 1992, when Russia began taking steps towards capitalism, Sutyagin cornered (some say through gangsterism) the lumber business in Archangel. Now the richest man in the city, Sutyagin wanted to display his wealth and had plenty of lumber, so in defiance of building codes, he began expanding his house. He kept adding on bit by bit, occasionally stopping for a time, only to resume again. At one point, after a few years, he thought he was finished, but then realized that if he kept going a little higher, he'd have a view of the sea. His work was finally halted in 1998, when he was sent to prison for four years on racketeering charges. When he was released, he discovered that his rivals had robbed him blind and now he didn't have the money to finish his home or to bribe building inspectors (Archangel has a two story limit on wooden structures). To stave off authorities, he sealed the roof at the second floor and claimed in court that everything above was decorative. 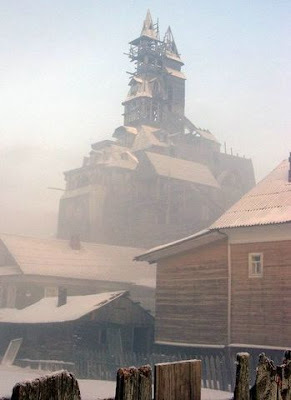 However, in 2008, the city condemned the property as a fire hazard and on December 26, 2008, demolition began. I always find it interesting what one man can do if he puts his mind to it. 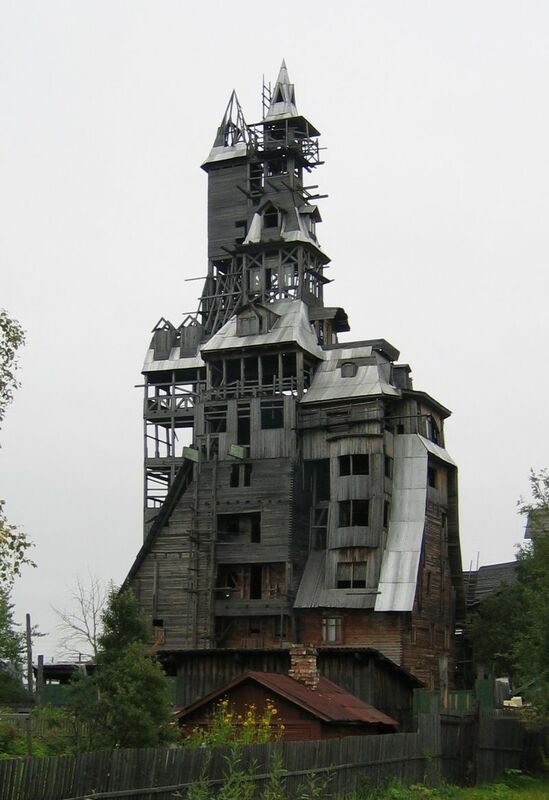 It's gangsterism, you can not monopolize a business in russia without the aid of the russian mafia.The Sutyagin house should have been preserved, authorities should have inspected it thoroughly and supplement what it lack in the building and fire code... or revise both codes to suit the wooden house. The city can file tax evasion charges against Sutyagin, evict him and sequester the house in the city' favor. They can turn it into a museum or a city heritage sight. Boy, I can tell a magnificent building when I see one. You really do find the most interesting historical items, Nate. Thanks. I'm glad to see that Live Feed has me back in WY now. Neat little bit of trivia. Thanks. It got me to wondering whether anyone has tried using modern concrete and steel methods, ?scaffold and curtain wall?, but using wood. How high can you stack wooden beams end to end without shattering the bottom ones? It is sad the Sutyagin House doesn't exist now. I would like to see it with great pleasure! It is so mystical. By the way, guys, I found out about this handyman service https://youdo.com/india/chennai-services/repair-renovation-services/carpenters/ I am going to find there a carpenter for my little house.